Soon after the snow retreats from Alaskan roads, bicyclists in sleek, colorful, body-hugging outfits begin zipping along with cars, pickups, and the earliest of what will become the summer profusion of motorhomes. Today’s cyclists had predecessors dating back well over a century. Terrence Cole, Professor of History at the University of Alaska Fairbanks, described some early bicycling in Alaska in the following Fairbanks Daily News-Miner article originally published on May 1, 1978. 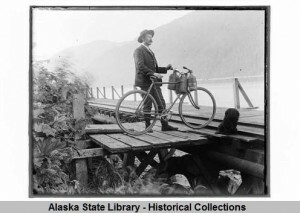 Man with a bicycle on the dock at Yakutat, Alaska, circa 1920. 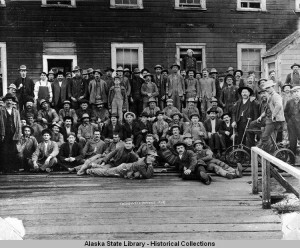 ASL-P55-293, Fhoki Kayamori Photographs, Alaska State Library Historical Collections. Though some people think of the bicycle as a toy, like a skateboard or a Frisbee, in the 1890s the two-wheeler was the technological wonder of the day. In magazines there were serious scientific articles about why bicycles would replace the horse, and miiltary experts like General A. W. Greely, the Arctic explorer for whom Fort Greely is named, thought that in the future, high-speed Army communications would be carried long distances by men on bicycles. In Alaska during the gold rush, the people who sold a special model called the “Klondike Bicycle” claimed it was the answer to every miner’s prayer. On this wonderful bike each man could carry his necessary 1,000 pounds of supplies 500 miles from the Chilkoot Pass to the goldfields with ease and comfort. Treadwell Miners, 1908. ASL-P40-26, Juliene Nick Dexter Photograph Collection, Alaska State Library-Historical Collections. There are several amazing accounts of wheelmen riding down the Yukon River or up the Valdez Trail to Fairbanks. Last February, Alaska Magazine ran a story by Max Hirshberg about his bicycle trip down the Yukon in 1900, which he wrote in the late 1950s so his grandchildren would know the true story of his adventure. But he was not the only one who stampeded to Nome in 1900 on a bicycle seat. Ed Jesson was hunting caribou near Dawson City in 1900 when he decided to join the rush to Nome. Ed bought a “wheel,” as bicycles were generally called then, from a man who had just ridden it in from the coast. When Ed’s brother heard the news he couldn’t believe it. Ed described what happened in his diary. After practicing for a few days in Dawson and learning to keep his front wheel in a sled track, Ed took off down river. One day the temperature was down to 48 below. His rubber tires were frozen hard and stiff. All the way down the Yukon people thought Ed was crazy for riding a wheel, especially since he owned a good dog team, but he said he didn’t have to cook dog food for the bicycle at night, and on good days he could cover 100 miles. Many of the old-timer miners and Indians on the Yukon had never seen a bicycle before, and Ed was always showing how it worked. After more than a month on the trail, Ed pulled into Nome, and except for the bruises he had from constantly falling down, he and the bike were in good shape.